It has taken us a while to perfect this recipe. 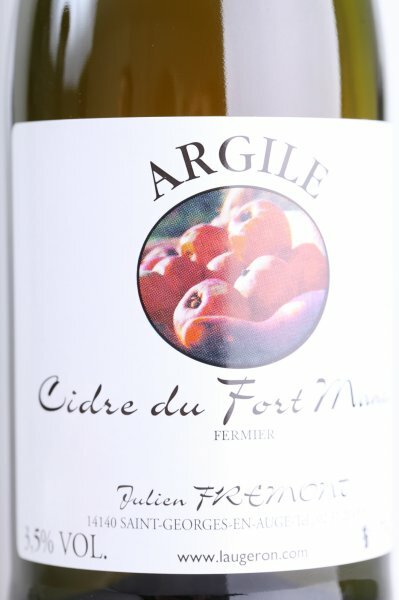 There are many variables to take into account: the amount and kind of cider and apples, type of flour, amount of kneading, the times and temperatures and so on. So we did quite a few test runs before we came to this final result. 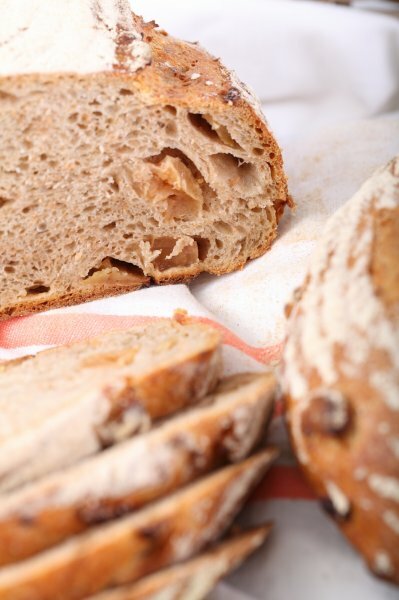 The things we like about this recipe is the tenderness and texture of the crumb, it gives the apples something to hold on to. We wouldn’t recommend adding any other flavor to the recipe. It’s all about the apple in this one! It’s a delight with homemade pumpkin soup or dipped in a French cheese fondue. You can prepare the apple parts that go into this recipe the day before the actual baking of the loaf, but you can also make them several days in advance. 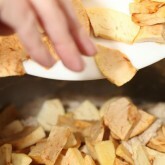 The apple parts are partly dried for one hour in the oven at a temperature of 110ºC / 210ºF. You can store them in an airtight container in your fridge, they will keep for one or two weeks, but not indefinitely because they still contain some moisture. 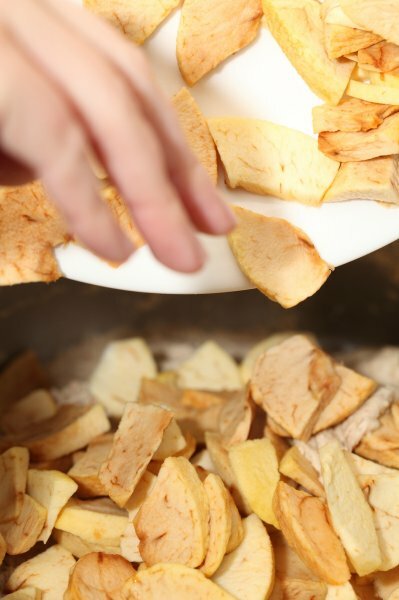 The advantage of this part drying is getting an intense apple flavor without losing all the juiciness of the fruit. We use a Dutch apple variety called ‘Goudreignet’, also commonly used for apple pies. 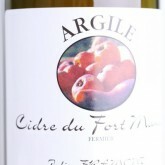 We have tried different ciders from Normandy for this recipe. 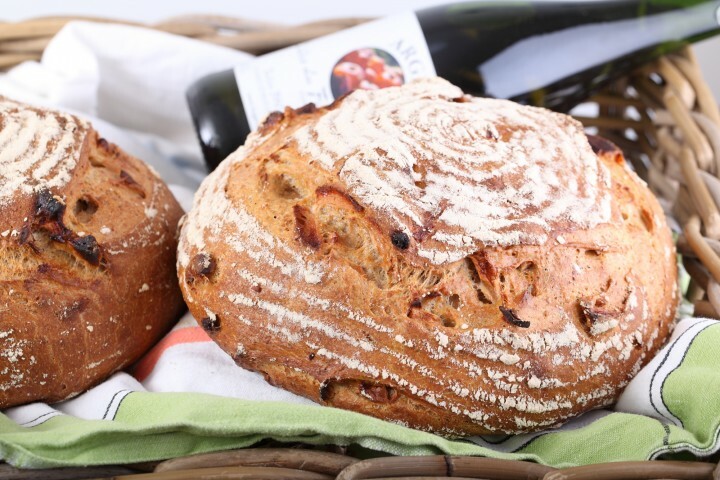 The difference in taste in the finished product is really not that obvious so I would suggest not to use your most expensive cider in the bread but instead to drink it with the bread! We think all good honest (organic) made cider’s will work. 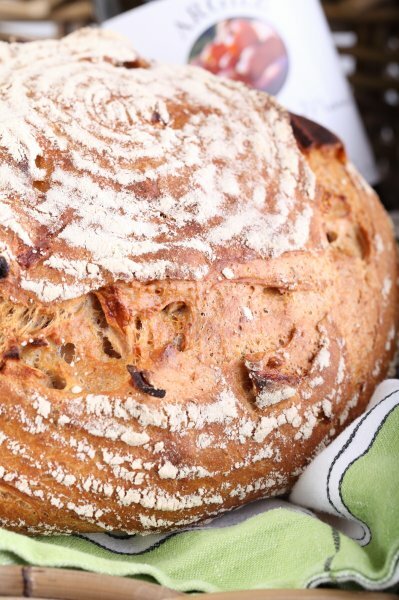 This loaf is made with a stiff sourdough preferment. 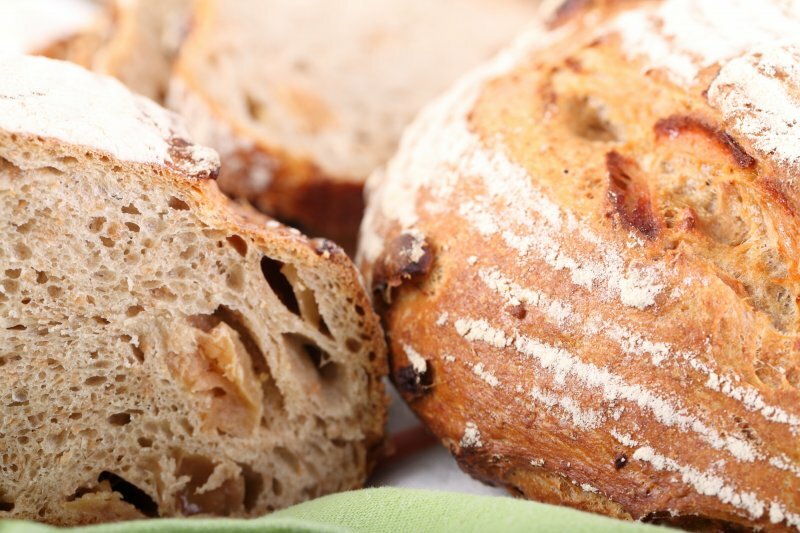 You make the preferment the evening before you make the loaf provided you want to bake it the next morning (it takes 12 hours to ferment). 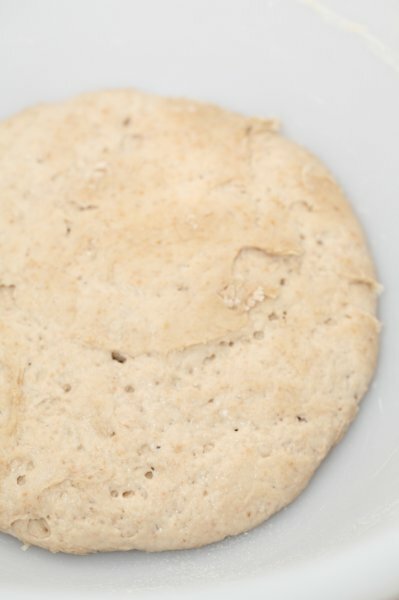 Make the preferment by dissolving 18 grams of your active sourdough culture in 55 grams of water and add 90 grams of bread flour. Stir until it comes together and finish by quickly kneading the dough by hand until you have a ball, this takes about one minute. 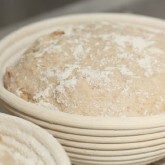 Put the dough in a bowl, cover it with clingfilm and let it ferment for 12 hours at room temperature. Preheat your oven to 220ºC / 430ºF (at what stage you preheat your oven depends on how long it takes your oven to heat through, some take 30 minutes, some with stone floors take a lot longer, up to two hours). 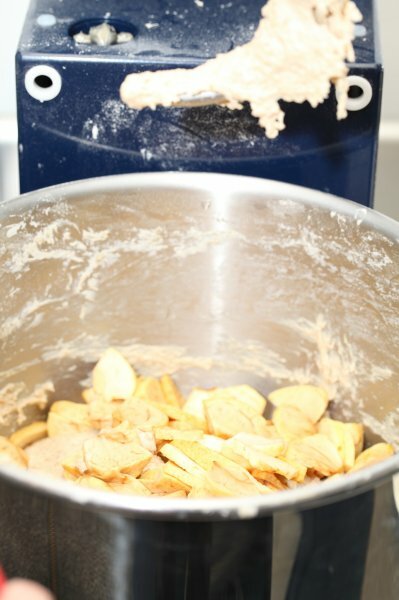 Put the preferment, flour, salt and yeast in your mixing bowl and add the cider and 1/3 of the water. 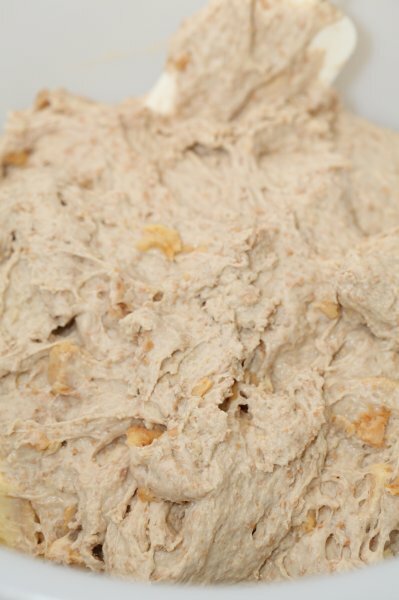 Now start mixing and gradually add the rest of the water and let the dough come together (see if you need all of the water or even a bit more, depending on the flour you use). As soon as the dough starts forming a ball add the soft butter. Knead for 3 minutes and feel if the dough has the right consistency, the dough should be a little sticky (a little bit more sticky than a post-it note) but it should be able to hold its form; not too wet or too dry. 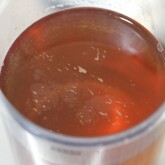 Add more water if needed, but do it one teaspoon at a time. Knead for another minute. 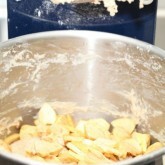 Now add the apple parts and knead them through the dough until evenly distributed. 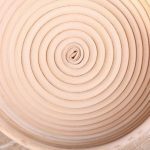 This is an easy job for a spiral mixer. If you do not have one, maybe the only way to get the job done is by hand. 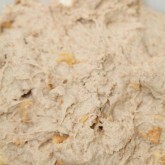 Transfer the dough in a bowl sprayed with oil, cover with clingfilm and leave to rest for 45 minutes. Take the dough out of the bowl and onto a floured work surface and do one stretch and fold (see our bread movie to observe this technique if you are not familiar with it). Transfer to the bowl, cover and again leave to rest for 45 minutes. Now it’s time to shape. Shaping is something for which everybody develops his or her own technique over time. 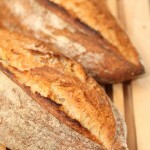 You can make a batard or loaf shape or a boule (ball). 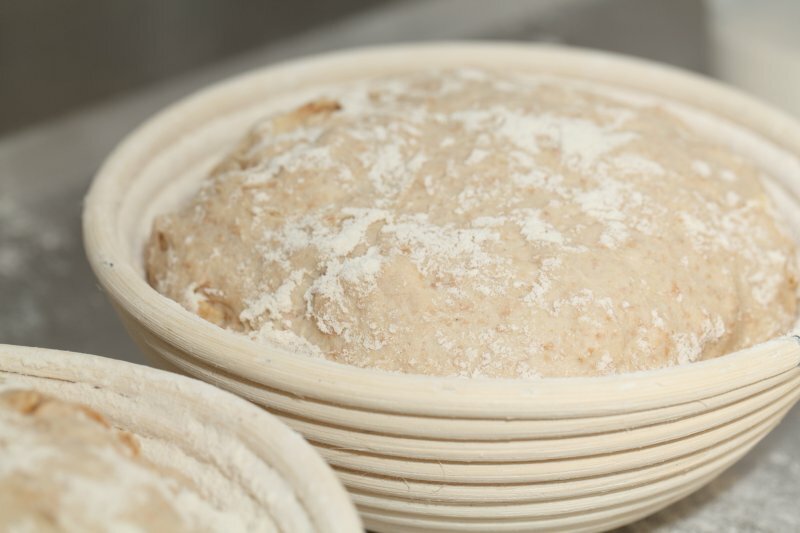 Transfer the shaped dough in a proofing basket or baking pan, cover and leave to proof for 60 minutes. 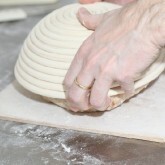 When you think it has risen enough, use your finger to carefully make a very small dent in the dough. 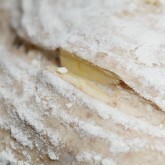 If the dent remains, the bread is ready to bake, if the indentation disappears, the dough needs a little bit more time. Now your loaf is ready for the oven. 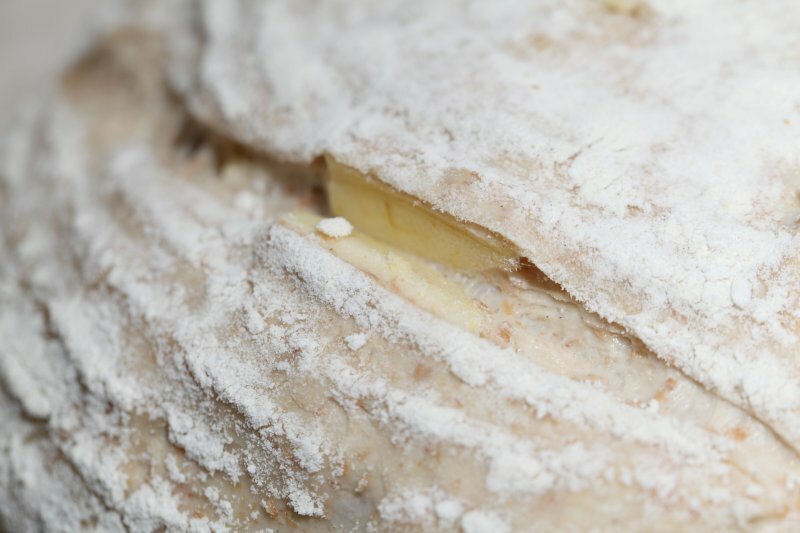 Slash the top of the loaf with a lame or bread scoring knife. To get a nice crust, try to create some steam in your oven by putting a small metal baking tray on your oven floor when you preheat the oven and pouring a half cup of hot water immediately after putting the bread in the oven. Release some steam by setting your oven door ajar (perhaps with the help of with a wooden spoon) 5 minutes before the bread is ready. 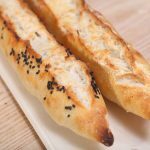 If you are going to create steam with a baking tray, you maybe also want to turn your oven temperature a bit higher, because you are going to lose some heat in the process. Keep a close eye on the bread. 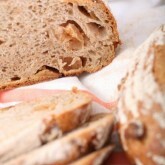 Because of the sugars in the cider the bread can take on a darker color during baking. 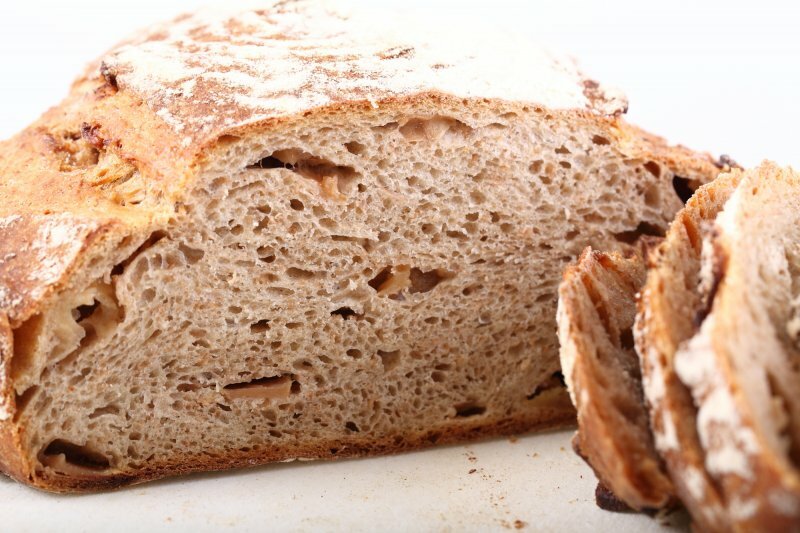 If you think your bread has a nice light brown color, temper your oven so the radiation heat will stop. 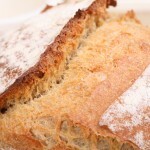 Do not think about taking out the bread too early, because it will not be cooked properly. After 45 minutes of baking your loaf should be ready. Transfer onto a rack and leave to cool. This loaf also keeps well in the freezer. Cider question: Is the cider in this recipe fresh or fermented 🍺? I am in upstate NY and we purchase Apple 🍎 cider by the gallon((3.78L)—-so I was going to use that, but I began to think that maybe in Holland, the cider is bottled/fermented. My preferment is waiting and the apples 🍏 ready, so I am going to use the fresh cider—-it may not matter. I will let you know how it goes! 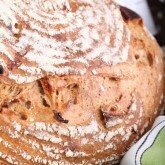 On another note—-THANK YOU for saving my 1 yr old Rye Levain! 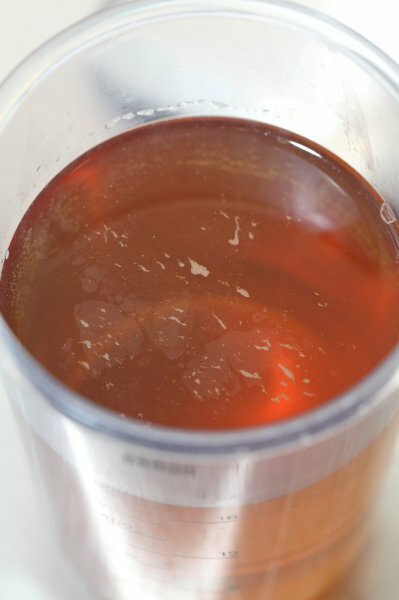 It went from a alcohol-flooded mess to a fruity aroma—bubbly & happy! 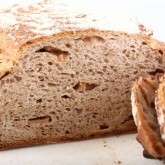 I am using it in this cider bread! How thick do you cut the apples? It is no exact science, but on average about 3 to 5 mm or o.1to 0.2 inch. Would it be okay to add 2 more stretch and folds with 45 min rests in between before shaping or does the gluten development ruin the loaf? 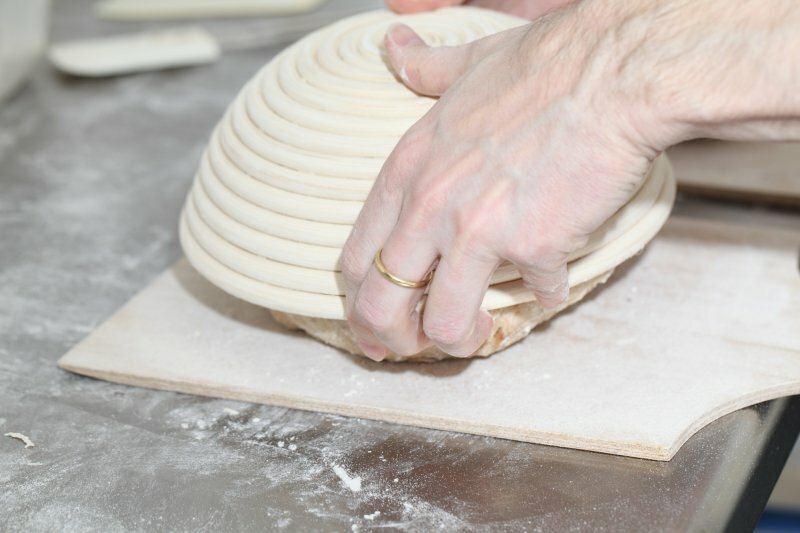 We do not fully understand exactly why you would want to do this, but we would only advice doing it if the dough is still ‘cooperating’ and does not resist the S&F because that could damage the dough. 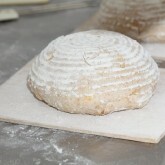 The flour on top is the (organic stone ground) bread flour we use for a lot of our breads. I have some questions here, please help. 1) May I know for the ingredients of the loaf, the instant yeast measurement “2,4 g” does it mean 2 to 4 grams or 2.4 grams? 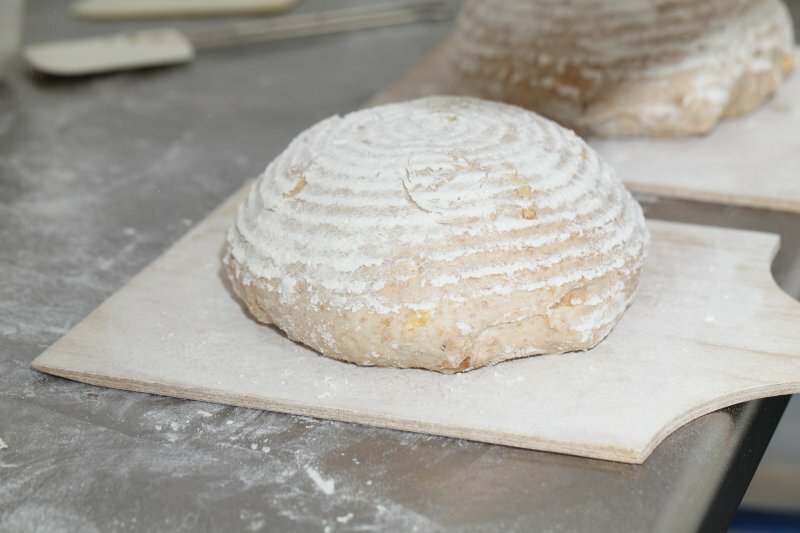 3) For the baking stage, when we use the baking tray for steaming purpose, and place the tray on the floor of the oven, will it reduces or blocks the heat from bottom heat and does it create an issue that the upper part of the bread baked quicker than the bottom part of the bread? Yes, the 2,4 is the same as 2.4 (in Holland we use the comma, but I corrected it, so thank you for noticing). Yes you can use yeast for the preferment, but if you are going to leave ut for 12 hours, like the recipe states, you should use a tiny quantity. 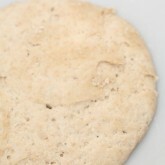 You should use about 0.2 grams of yeast, which is less than 1/8 of a teaspoon. Happy baking and lots of loaves! Looks great! I’ve also been experimenting with apple breads (www.thebreadshebakes.com/2014/07/apple-bread-recipes/) using apple pieces of various shapes and forms. I used fresh grated apple for my first loaf, then dried apple pieces (like above), but also fresh apple slices mixed with pecans. 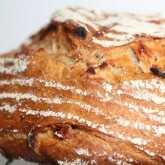 I personally really liked the apple and pecan focaccia bread. 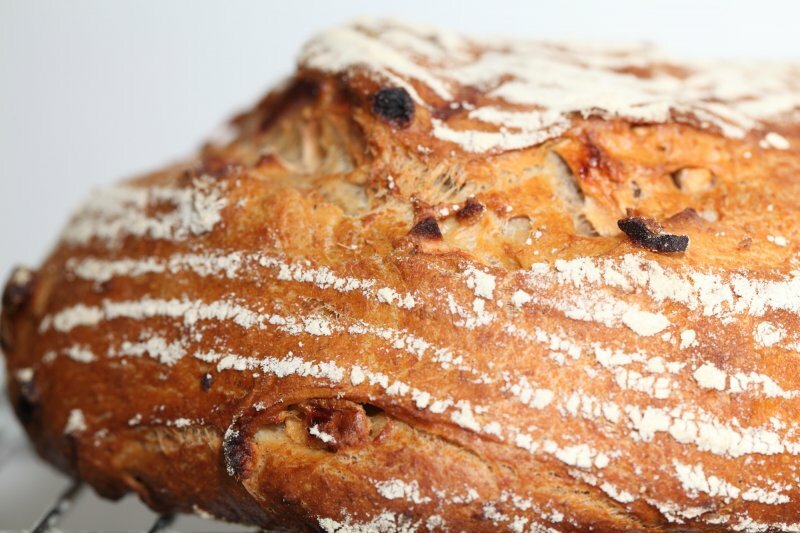 It’s a bit awkward to knead the fresh apple slices into the dough, but the baked loaf is beautiful, moist and has an almost perfect level of sweetness. Thank you for sharing that all sounds totally inspirational! Love the combination of apple and pecan (love pecans with lots of things!) 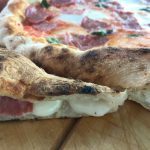 and would not have thought to combine it with focaccia. That is so inspirational, I must try that too! It’s the same brainwave I have sometimes, wanting to put recipes in a bread. Same with the muesli and yogurt. 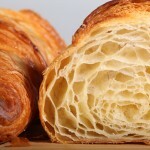 I want to put the breakfast I normally eat in bread or muffin shape so I can eat it on the go. 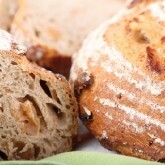 Would love to know if you taste any difference in the bread when using different types or qualities of cider. Thanks so much for sharing and good luck with your baking class! Very nice! Great minds must think alike then – I am holding a baking class in 2 weeks time and one of the bread is Cider raisins, bacon and coriander + bites of apple here and there – the whole cider/pork/coriander/apple thing came to me after I cooked a pork roast in the oven deglazed with cider and chunks of apple.